Sometimes you may need to open a folder of a file, which gets often open from a ribbon. Most likely you didn't put the folder on the ribbon yet. And you don't have to! The context menu has a menu to do just that! 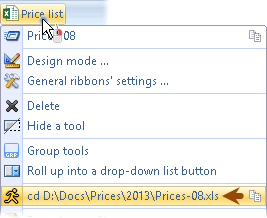 You open a document from a ribbon. You need to copy it on a Flash-drive. Do it the same way. Navigate to this document with the context menu and make a copy.